The Revco -20°C Explosion Proof Freezer provides secure, upright storage for your volatile class 1, groups c and d materials. This 16 cu ft specialty purpose freezer is constructed with a corrosion resistant spark proof interior, and has a maximum storage capacity of 10 gallons. For maximum efficiency and safety when installing this lab freezer users should observe a clearance of 12 inches at the top, 3 inches at the back and sides, and at least 40 inches at the front. This explosion proof freezer features a hermetically sealed compressor with manual defrost, 4 fixed height shelves, 6 in door shelves, and adjustable leveling feet. All of the electrical components are encased in corrosive proof steel, while the door features a magnetic gasket which minimizes temperature leaks, along with foamed in insulation. 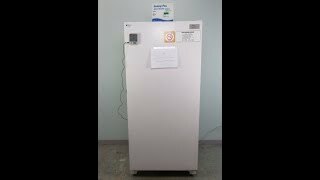 This Revco -20°C Explosion Proof Freezer has been fully inspected and comes backed with our standard warranty. Should you have any questions, please don't hesitate to contact us.